The path running through town from “Oburn” toward Salem is one of the oldest thoroughfares in town. 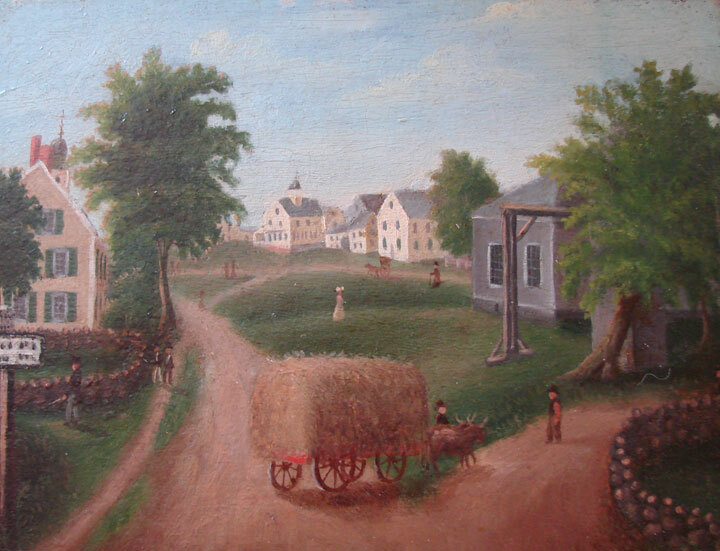 In 1689, the town’s meetinghouse was moved to approximately the current location of the First Parish Congregational Church, making that, for a time, the center of the town’s activity. Church and Prospect Streets were in common use by 1681. The painting that you see above is by Wakefield artist Franklin Poole (born in 1808). 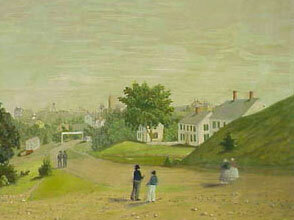 It shows how Prospect Street looked in the mid nineteenth century. Imagine that you are standing near the West Ward School and looking down the hill. The white gate at the bottom of the hill is the railroad crossing. We’ll begin our tour at the very top of Prospect Street, and walk down toward the Common. At the very top of the hill is the home of one of the most remarkable women in Wakefield’s history. Elizabeth Eaton Boit was one of the co-founders of the Winship Boit Knitting Mill, which provided employment for hundreds of residents. She lived on Richardson Avenue prior to building this house in 1913. Its actual address is 127 Chestnut Street. She built two other houses along with this one, in order to provide homes for some of her family members. They formed a compound which faced inward toward formal gardens and included greenhouses, a tennis court and a playhouse. 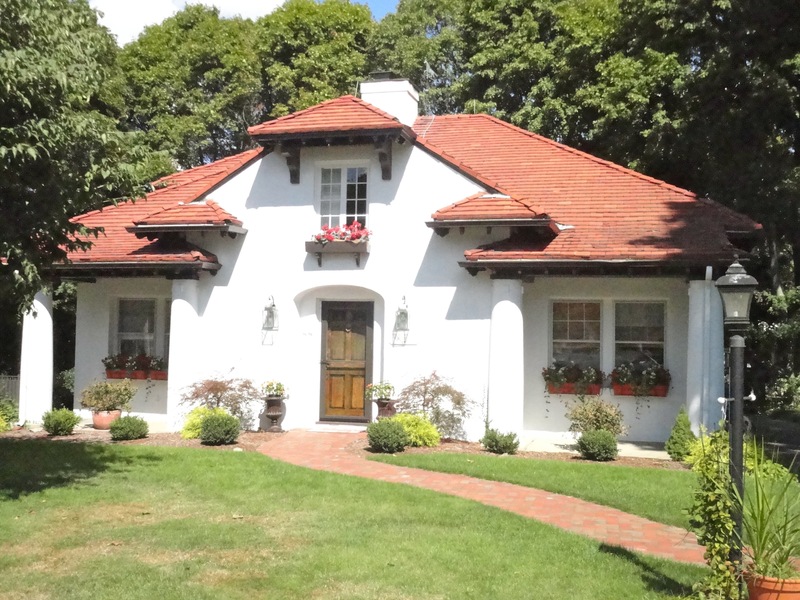 The homes are built in the English Cottage Style and were designed by architect Harland Perkins. The homes are on the National Register of Historic Places. 90 Prospect Street was built by Miss Elizabeth Boit for her niece, Emily Freeman. The land for these homes was purchased from George Carpenter, a Wakefield resident and dealer in paints and oils. Miss Boit, like manufacturers Cyrus Wakefield (wicker and rattan) and Solon O. Richardson (medicinal bitters), was known for her generosity and civic activities. She founded the Wakefield Home for Aged Women. She was also the first woman in the United States to serve on the board of directors of a bank: the Wakefield Cooperative Bank. From her position on the bank’s board, she sought to protect the interest of her women employees, and the rights of women to their own bank accounts. 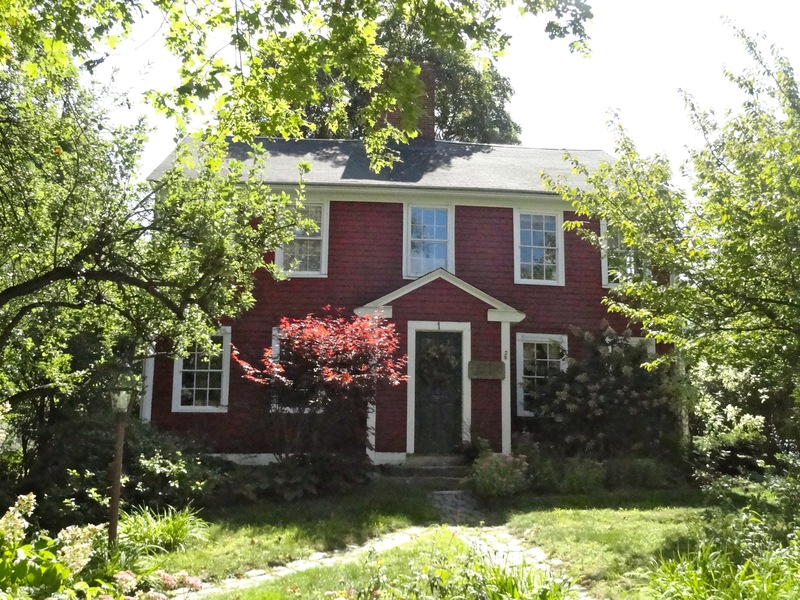 88 Prospect Street is the third of the English Cottage Style homes built by Miss Boit for her family members. 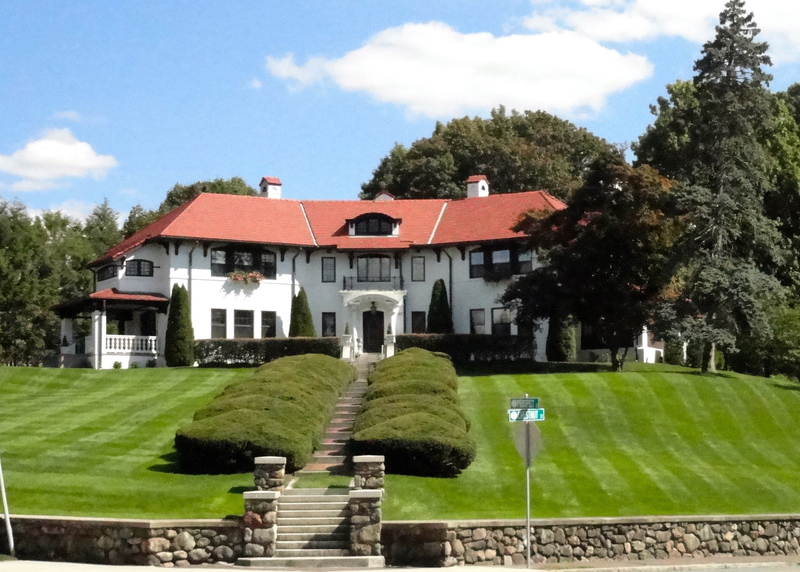 English Cottage Style architecture was introduced to the Boston area at the turn of the century by C.F.A, Voysey, an English architect. Harland Perkins was a locally prominent architect who lived at 8 Park Street. Perkins later was responsible for helping to lay out the Floral Way and the re-setting of some gravestones at the Old Burying Ground. Let’s backtrack a bit, and go back to the corner of Prospect and Chestnut Streets. The yellow house on the corner is 98 Prospect Street. In 1890, it looked like this. Prior to 1894, part of this house was removed and placed further west on Prospect Street. In 1894, that fragment was moved once again to 3 Hopkins Street. 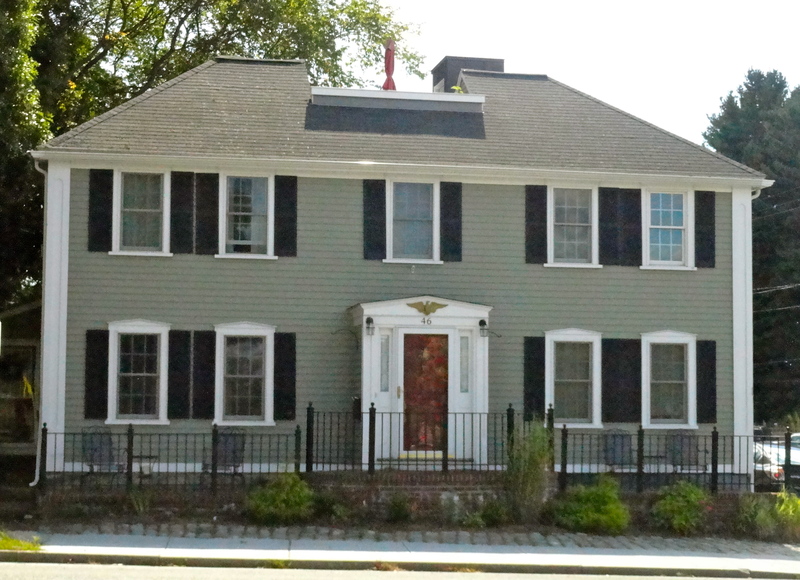 This house (98 Prospect Street) was originally built ca. 1833 by Aaron Cowdrey, and formed one of three houses associated with the Cowdrey family. Originally, the hill that you are standing on was called “Cowdrey Hill” because it was owned by the Cowdrey family. William Cowdrey was one of the town’s first settlers and the first Town Clerk. We will see the site of his home on the hill. Aaron Cowdrey was the son of Nathaniel, who lived across the street in the family’s ca. 1790 homestead. *Editor’s note: some of the contemporary photographs on this tour were contributed by Gene Moulton. 71 Prospect Street. This is the approximate site of the original homestead of William Cowdrey. It was the home of Nathaniel Cowdrey in 1765 when the area was first mapped. Cowdreys lived in this house until 1866 and the family retained possession of some of the original farmland and an adjacent house until c. 1900. This is a ‘stereo view’ look at the area in the 1890s. 71 Prospect is in the foreground. That’s 61 Prospect in the distance. The house was built around the time that Aaron Cowdrey built the house at 98 Prospect. 61 Prospect was built by his brother Jonas. The land and house at 61 Prospect remained in the family’s hands until 1900. 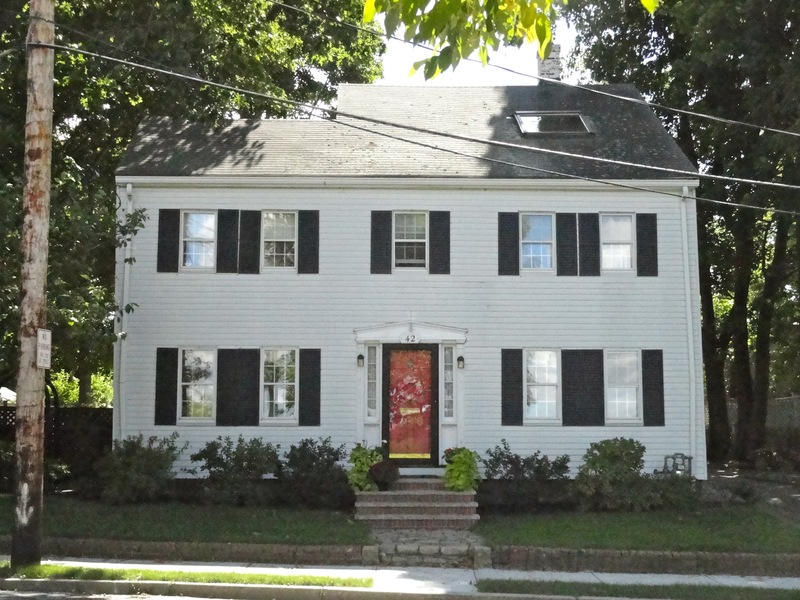 61 Prospect Street is a “3/4 house,” considered Federal in style. It is 2 1/2 stories in height and is 3 bays wide. Both 61 and 71 Prospect Street are on the National Register of Historic Places. 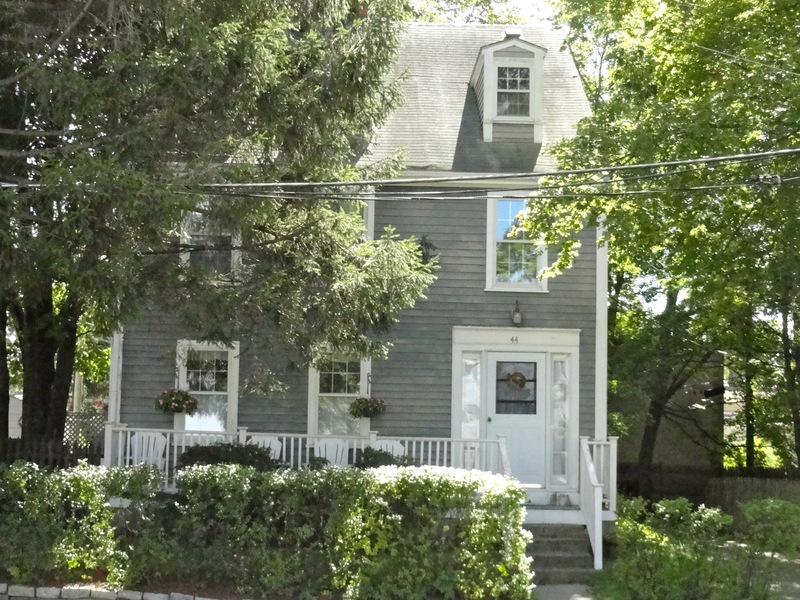 Jonas Cowdrey, the owner of 61 Prospect Street, served as a selectman and also as a member of the School Committee, which was handy because he lived quite close to a school. Let’s walk down to that school now, at 39 Prospect Street. 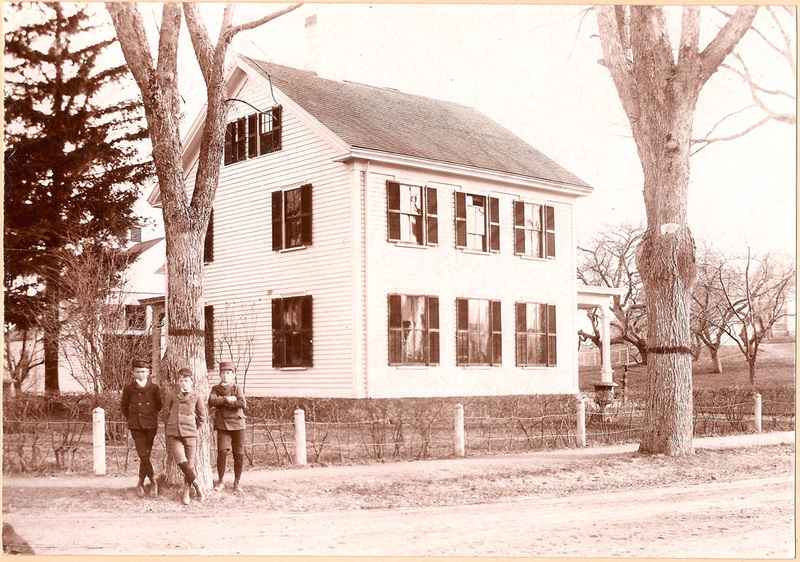 The West Ward School was one of four “ward” schoolhouses built to serve the town of South Reading in 1847. The town had just experienced a huge growth spurt due to the extension of the railroad through its center. The four schools were built to serve the increased population. 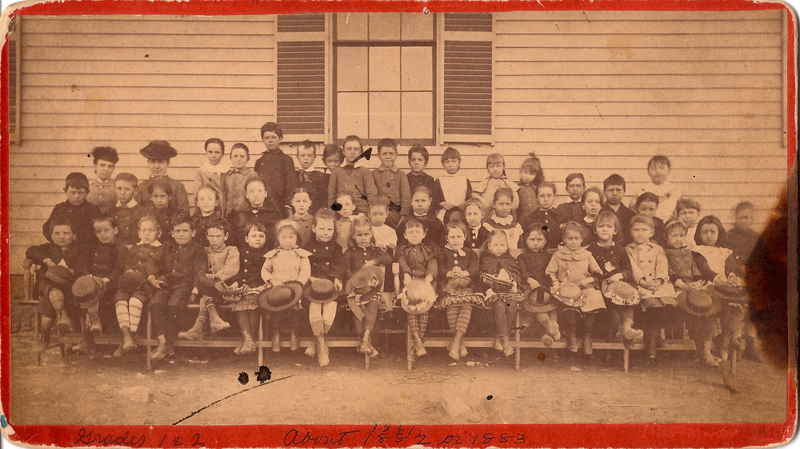 This is a class photo from the 1880s. For a full history of the West Ward School, click here. The West Ward School served the town as an active day-to-day school until 1994 when a ruptured sprinkler pipe alerted the town of an emergency: the second floor ceiling had collapsed. The Wakefield Historical Commission worked to achieve a grant from the Massachusetts Historical Commission which, with help of private funding, and the West Ward School Association, has restored the building’s structural stability. The building’s original appearance has also been restored. The building is now the home of the Wakefield History Museum. The first floor classroom retains many of its original ca. 1847 features, which had been covered by paneling, ductwork and cabinetry. The building is on the National Register of Historic Places. 24 Prospect Street is a Greek Revival building constructed around 1835. It is one of the largest Greek Revival buildings in Wakefield. It was owned by William Atwell for most of the second half of the nineteenth century. Atwell was a manufacturer of razor strops, and had a small factory behind his house. It was very common in Wakefield to have a small outbuilding behind your residence, whether you were making shoes (a very common occupation here), rope, or even crutches. 22 Prospect Street, the William Stimpson House, was built prior to 1795. The Federal style home has a central chimney and reportedly may contain an original mantlepiece by William McIntyre, the Salem Federal designer. There are six fireplaces and two brick ovens in the house, which may indicate that it was at one time used as a two-family. William Stimpson was a physician and son of Dr. Thomas and Mary. Earlier in his life, William had lived in Greenwood in a large house that he moved to the corner of Main and Salem Streets prior to 1765. Some time after that, he had this home built. A subsequent owner was William Atwell, who also owned the house next door. The Atwell family owned this house into the 20th century. The house is on the National Register of Historic Places. This old dwelling houses one of the oldest structures in the Town of Wakefield – its fireplace is probably original to the First Period of the Town’s development. Deacon Thomas Kendall and his wife Rebecca made their homestead on this land in the mid seventeenth century. Thomas Kendall was a First Parish Deacon and Selectman and one of the most prominent settlers of the early town. His wife Rebecca was the town’s midwife. The next well-known owners of the house were the James Emersons. It is believed that Mrs. Emerson died in a fire that consumed the majority of the house on this location around 1768. The present day house was reconstructed on that site at about that time. The Emerson family and its descendents lived in the house and farmed the diminishing holdings through much of the 19th century. They continued to occupy the house into the 20th century. James E. Emerson was a farmer by trade, but was also listed as a shoe cutter in the 1874 Directory. In 1860, Emerson was listed as owning 7 acres mowing and tillage on Elm Street, a barn five acres of pasture and meadow. The gradual break up of the farm began c. 1848 when Emerson Street was a private way laid out into house lots. 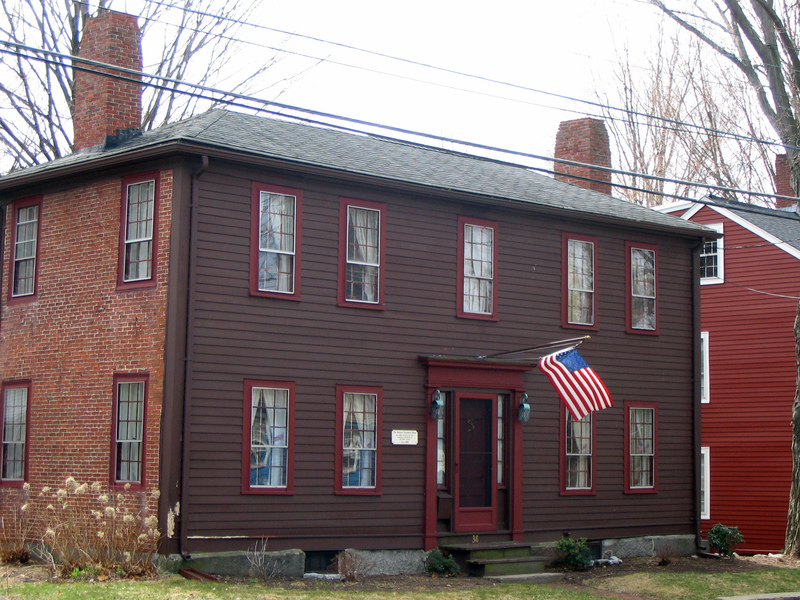 This five-bay, 2 1/2 story house has the exterior stylistic hallmark s of the Federal Style as it looked in Wakefield from 1790 – 1810. The house does, however, have unusual features which may be the result of its having been reconstructed c. 1786 reusing materials of an older building. The house is on the National Register of Historic Places. We’ll cross North Avenue now to continue the tour on Church Street. The Church Street properties named here are all on the National Register of Historic Places. With the commercial and government center of the town located around the Common in the nineteenth century, Church Street thrived until the business center of town shifted toward the south in 1850. Many houses were built in the early nineteenth century, like 46 Church Street, above. 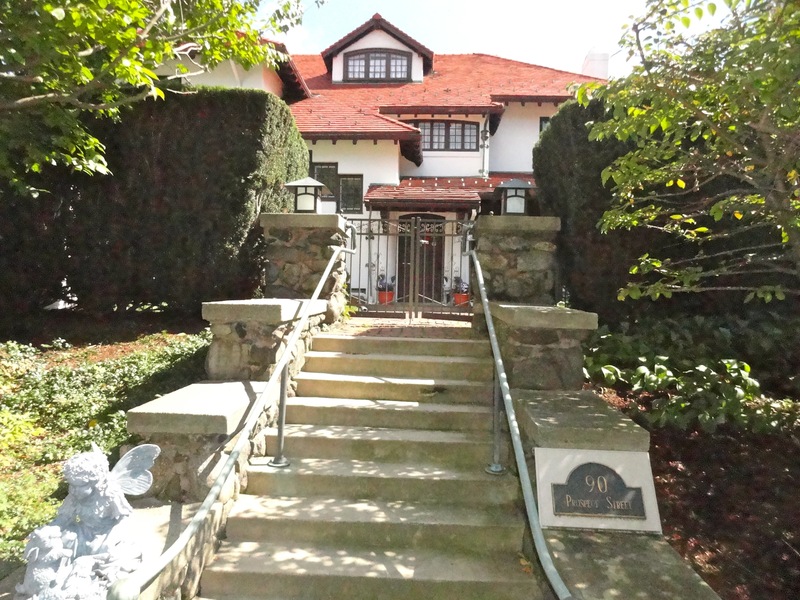 Built in the Federal Style, it was the home of William Emerson, but was owned by the Winship family for many years. 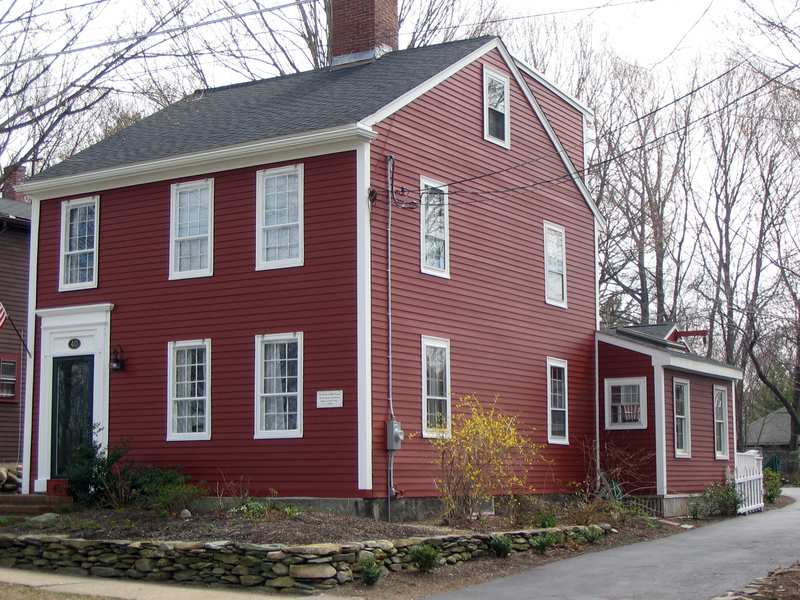 44 Church Street, called the Nathaniel Cowdrey houses, was built in 1790. It is one of a row of early Federal houses on Church Street which share a number of construction features. 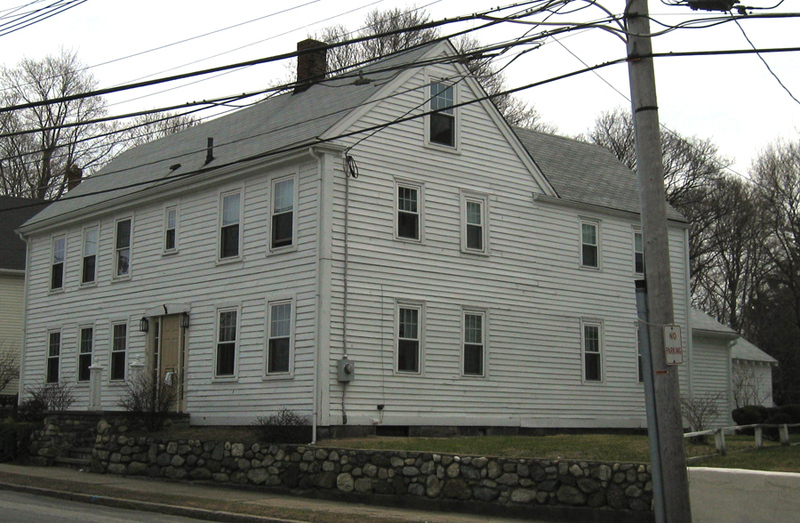 It is a ¾ house, like the much later house at 61 Prospect street. Historically, this house has been linked with its neighbor at #42. Both were built c. 1790-1800 on Church Street. By the 1850s each was owned by a Winship, Joel at this house and Samuel at #42. The tax polls of 1860 indicate that Joel and Samuel owned a carriage painting shop on the property of this house. By the 1880s, both houses were owned by George A. Seaver, superintendent of the Lakeside cemetery and Civil War veteran. 42 Church Street was built ca. 1800 in the Federal style by Samuel Stacy who came from Townsend, Mass. 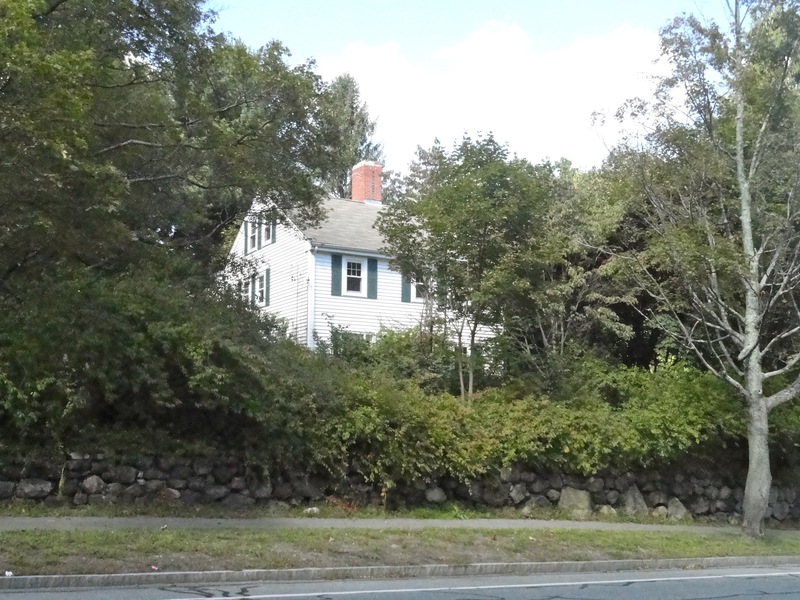 Prior to 1812, it was purchased by Joseph Atwell, a prominent citizen who served the town as Selectman and Town Collector. Later owners of the property were Captain William Emerson and Samuel Winship. 41 Church Street, the Colonel James Hartshorne House. 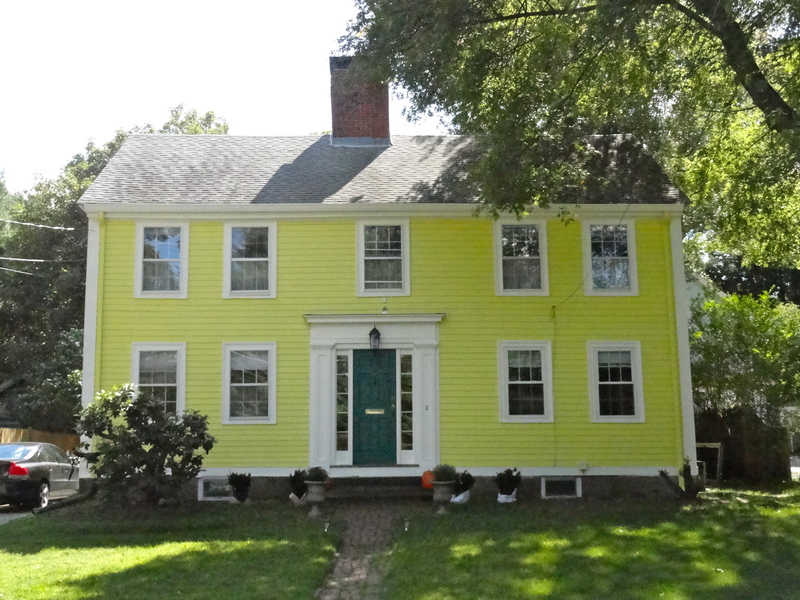 The earliest part of this house was built circa 1681 by Thomas and Mary Hodgman. A subsequent owner, Jonathan Cowdrey, was a clock and buckle maker who enlarged the house to two bays. Years later the house was owned by Dr. John Hart, a Revolutionary War surgeon and patriot, who used the house as income property. He enlarged the house to its present size and used it as an inn; the second floor was used by the Mount Moriah Lodge of Masons. The house was already very old when James Hartshorne, a cordwainer or shoemaker, bought the house in 1804. His family continued to own the house until 1890, when it was sold, along with the lakeside land adjoining it, to the Morrill-Atwood Ice House. The house was used intermittently as a tenement for icehouse workers until a devastating fire demolished the icehouses in 1929. At that time the house was purchased by the Town of Wakefield. 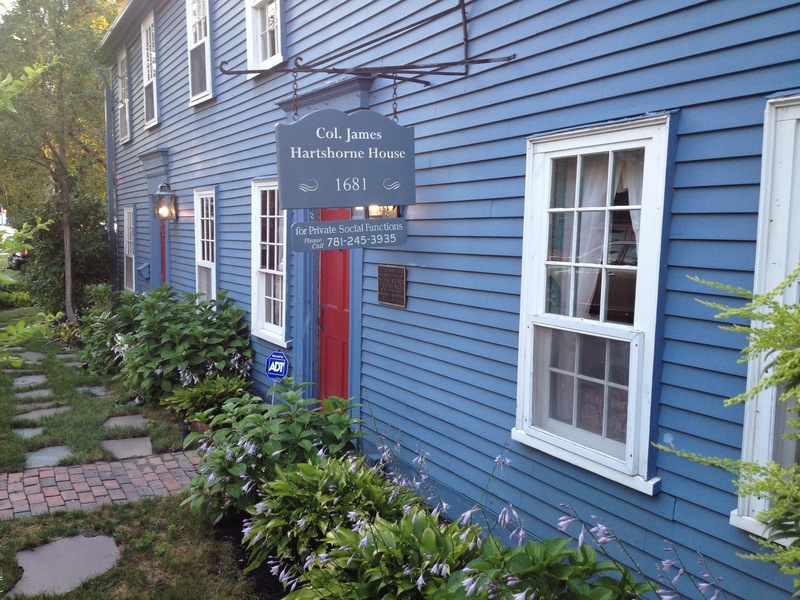 It is administered and maintained by the Colonel James Hartshorne House Association. 40 Church Street was built around 1804 for Ebenezer Wiley from a tin shop which was moved to this site from the spot where it originally stood on the Common. Wiley, a successful shoe manufacturer, was from a locally prominent family. His brother, Benjamin Brown Wiley, built 306 and 318 Main Street, near the Rockery. Ebenezer Wiley died in 1817 at the age of 36. The property was acquired by Benjamin H. Eaton. Eaton was active in the First Parish Church and in 1841 was elected a deacon. 38 Church Street was built in 1803 by Francis Hay, a cabinet-maker and the son of Dr. John Hay, who lived in the vicinity of today’s North Avenue. 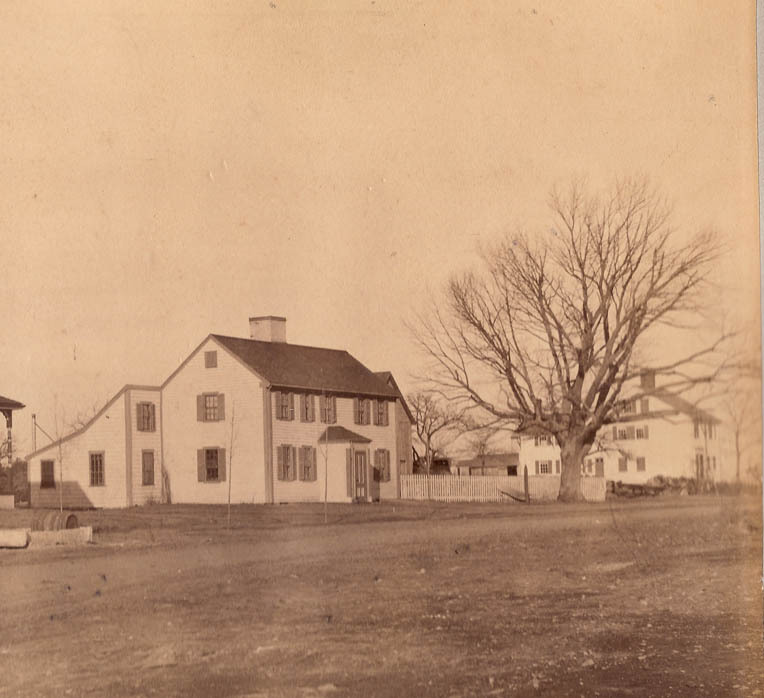 After living there for a time, Hay sold one-half of the house and land to his widowed sister, Elizabeth Hay Nichols, and the other half to Ebenezer Hartshorn, a brother of Col. James Hartshorn, who owned the house across the street. Ebenezer Hartshorn later acquired title to all the property at 38 Church Street and lived there for half a century. 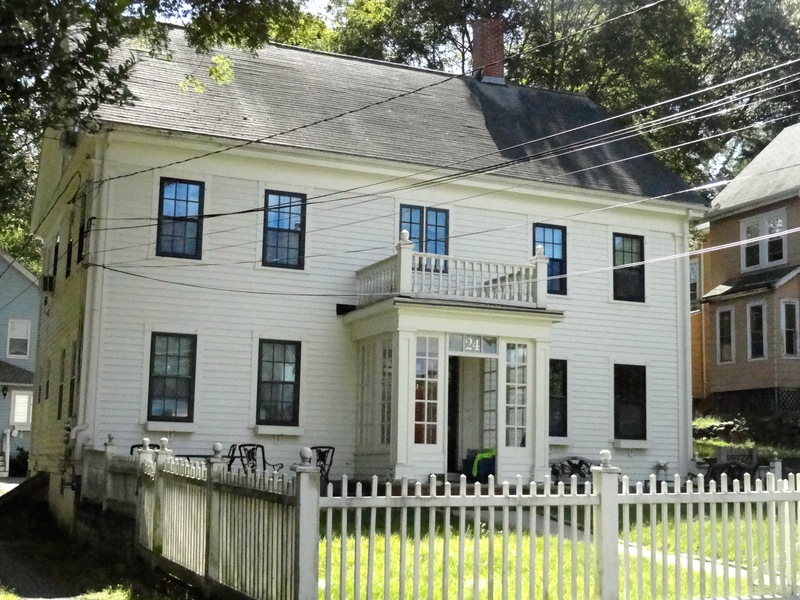 34 Church Street, a Greek Revival structure, was built by William Deadman, Senior, c. 1800 on the site of a small house in which he first had half interest and then bought completely. After he died, his wife and son William Dexter Deadman continued to live in the house. His son was the first Captain of the Washington Rifles from South Reading and was a partner in Deadman and Perkins, provisions merchants in town. W.D.Deadman was also the founder of the Golden Rule Lodge of Masons. This concludes the tour, but we encourage you to walk through the Old Burying Ground before trudging back up the hill! You might also like to walk down the Floral Way to the Lake. If you have enjoyed the tour, consider making a donation to the Wakefield Historical Society. We are a small, volunteer nonprofit organization. All donations help to maintain and preserve our museum at Wakefield’s beloved “Little Red Schoolhouse” at the West Ward School. The Wakefield Historical Society is a 501(c)3 nonprofit organization; all donations are tax deductible. To stay connected, you might want to consider joining our email list, below. Click here to be added to the Historical Society's email list. If you have enjoyed the tour and would like to make a donation to support our work, please click here to visit the Wakefield Historical Society’s website. 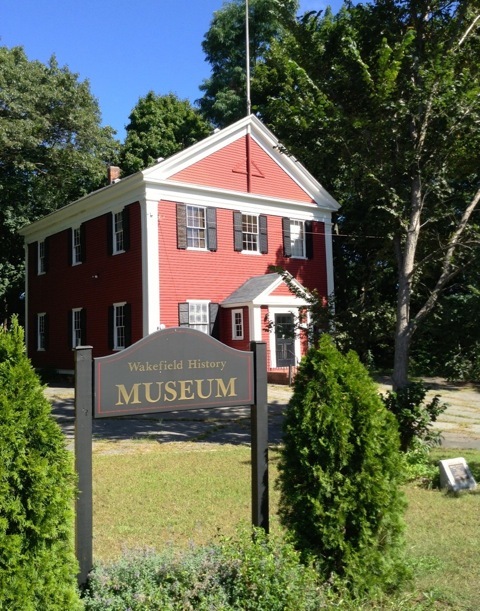 The Wakefield Historical Society is a volunteer organization. We thank you for visiting our site!